The ballast must match the bulb, no matter what. A 250w ballast is for a 250w bulb - always. You can not, nor should you, try to light a 175w bulb with a 250w ballast. There are (or were) probe start and pulse start ballasts. Matching the bulb to the ballast can be tricky. For me, there is really only one choice: IceCap Electronic ballasts. They light virtually every bulb, and their warranty can't be beat. Now that IceCap is gone, a similar choice is the Coralvue e-ballast. 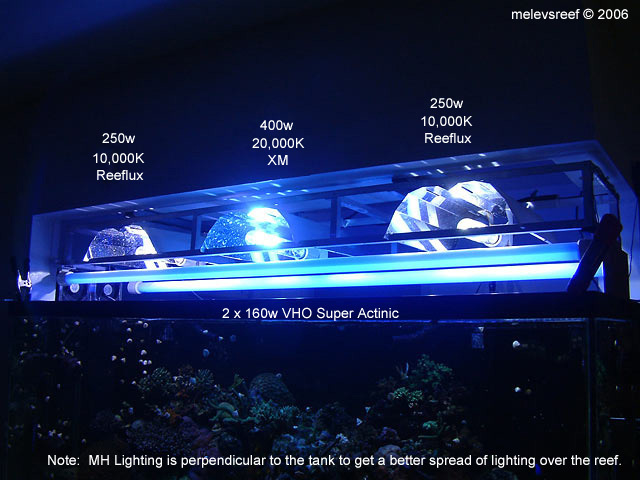 MH bulbs should be 9" to 12" off the surface of the water with standard reflectors. Each bulb covers a 2' x 2' area, unless you use the Luminarc reflectors mentioned below. They can spread light over a larger area. Mogul sockets have two wires usually, which connect to the ballast. It doesn't matter how these are connected; either way will light the bulb. Adding a ground wire to the reflector and/or socket is a wise option, mainly for safety. SE (singled ended) mogul bulbs can be screwed in to ceramic mogul sockets. DE (doubled ended) bulbs snap into ceramic or plastic retaining clips. 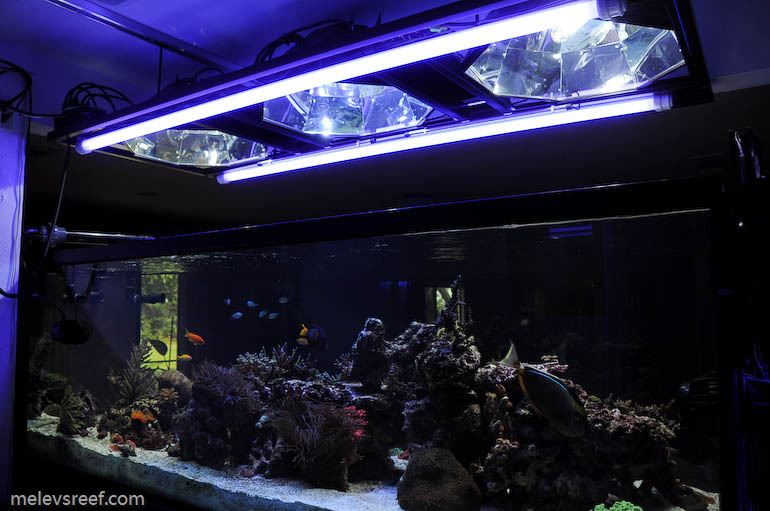 Note: DE bulbs always require a piece of tempered glass beneath the bulb to block UV from burning / bleaching corals. If you break or lose this glass, you must get another piece of tempered glass. 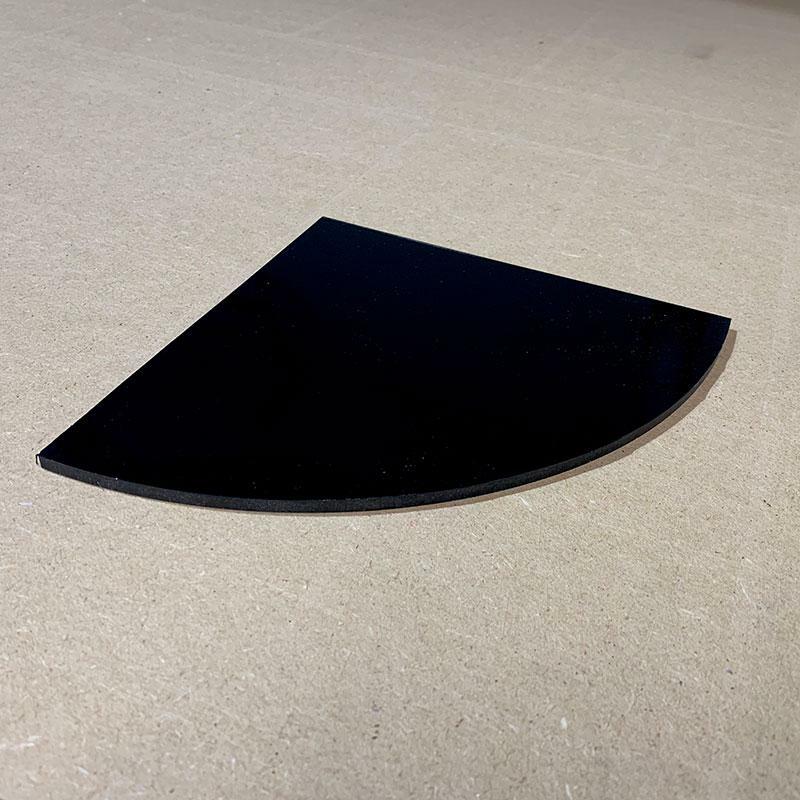 Regular glass will shatter from the heat within minutes. I've used both, but primarily like SE bulbs because of the greater options (brand & color spectrum) and their lower price. DE bulbs are more frail, and can be damaged during installation. Bulbs come in various 'colors'. 6,500K is yellow, and unpopular. People used them to get fast growth out of their corals. PAR is a way to measure intensity; how much light will punch through the water. 10,000K bulbs have much more PAR than 20,000K bulbs. People that use 10,000K bulbs tend to use Actinic VHO lighting to supplement the blue and get a nice overall look. I've used several brands of bulbs over the years. I really like XM bulbs and ReefLux bulbs. Ushio is another good brand at a higher price. Bulb Installation: Always wear gloves or maybe slide a sock over your hand to keep your skin's oils of the bulbs as you screw them in or snap them into place. This is very important. Spider reflectors are inexpensive and popular. It is what I used originally, and cost ~$35 per reflector & socket. Luminarc III reflectors reportedly are 300% better at spreading light, so you get more light for your money. These reflectors are huge (16" x 16" x 8"), and cost ~$125 each. This is a picture of how my lights were set up for three years. The light rack rolled back and forth for better access in the tank. Later I upgraded to Lumenbright reflectors that provided more than 300% more light, which I proved to myself by measuring PAR levels. Not only were they brighter, I was able to raise them up much higher off the water. That added clearance made working in the tank pleasurable. I've used Lumenbright reflectors ever since. With these, the MH bulb should be 16" to 18" off the water's surface.